The first time I came across Bhupen Hazarika's name was 18 years back when his soul-touching music and voice floated in the background while Dimple Kapadia in her Rajasthani attire denuded her body of all jewellery. It was Rudali, not exactly a favorite amongst the teenagers back then but truly artisty in every other sense. What made Rudali special for me was nor the breath-taking acting by the cast neither the off-beat, heart-wrenching story. In fact, it wasn't even the silky-smooth voice of Lata Mangeshkar bringing those rustic, alluring lyrics to our homes. It was that coarse, broken, seemingly untamed male voice that sang Maula O Maula, Dil Hum Hum Kare, Samay O Dheere Chalo, that stood out even to my untrained ears. 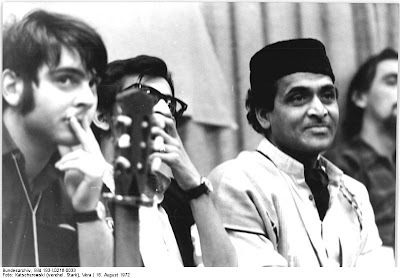 But of course, Bhupen Hazarika is (and in spite of his demise yesterday, I still say 'is') much (and much) more than Rudali. His singing career started as early as 1939 when he was twelve and he never looked back after that. Loved and respected worldwide, Bhupenda was never hassled by political boundaries. His has been credited to be the voice of the freedom movement of Bangladesh. His music and lyrics have enabled many a young hearts to express their complicated emotions. His songs dedicated to social causes and to the great river Brahmaputra are spiritual in a very earthy way. I can perhaps never fully appreciate or sum up this great man's life and acheivements but can definitely sense his absence. 2011 has definitely been a difficult year for Indian arts. M. F. Husain, Shammi Kapoor, Jagjit Singh, and now Bhupen Hazarika are amongst the famous artists who were lost to us during this year in quick succession. It seems like the time is moving too fast with each second taking us farther still from their legacy. I wish things would slow down a bit and let us submerge ourselves in the art and music created by these artists to fully appreciate all that we've lost. And, also, to appreciate all that we're left with. Here's Samay o Dheere Chalo by Bhupen Hazarika, in his own voice. Hope his songs keep echoing forever.